John Forster runs a radio show called Dr John’s Rock Surgery, which plays 100% unsigned bands. It has a substantial audience, partly thanks to syndicating to several radio stations. Obviously he plays rock although there is a fairly broad scope within the genre. The festival has been set up to raise money for a local charity, PATHFIELDS SCHOOL in Barnstaple Caring for children with Downs and severe learning disabilities. 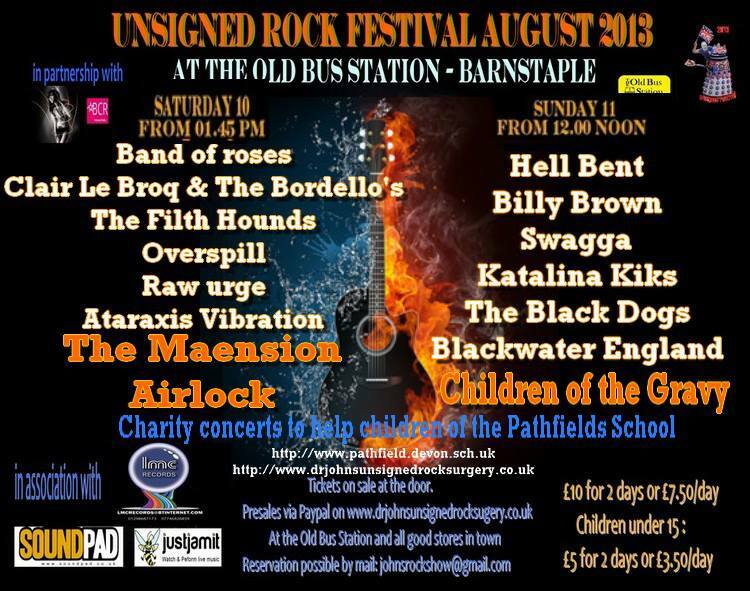 Of the bands playing, I have already heard of, or written about several of them, “Band Of Roses”, “Ataraxis Vibration”, “Billy Brown”, “Blackwater England”, and “The Black Dogs”. Based on my knowledge of those band this is going to be a totally brilliant couple of days. £10 for the two days is an absolute bargain and all profits go to the charity so I think this is a must see if you live anywhere in North Devon.